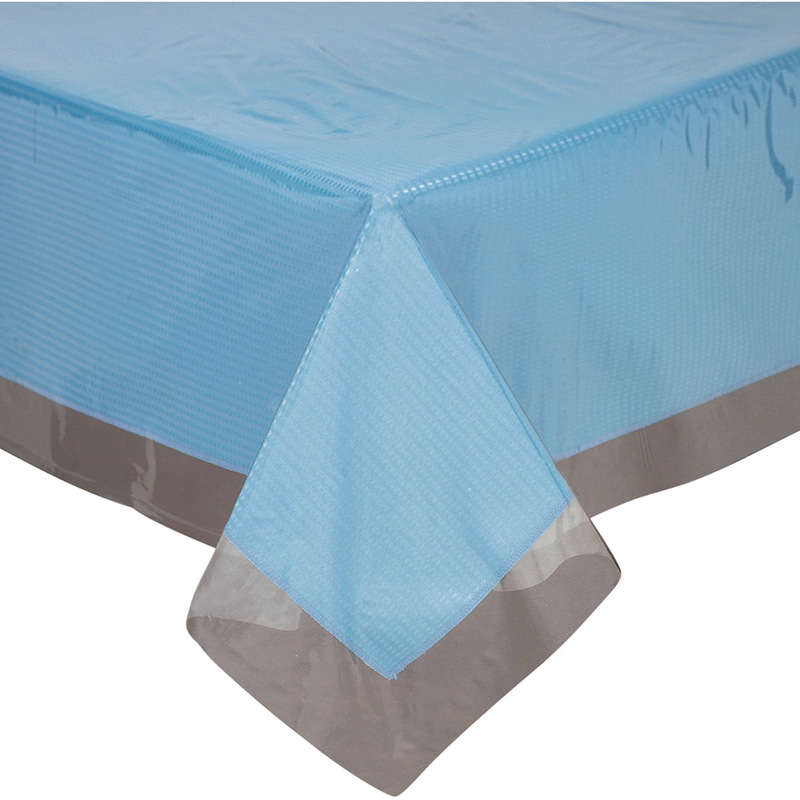 This product protects my table cloth and my table. No more spills, less laundry to do!!! It is a great help to keep the table looking clean and tidy. So far I've not found anything 'not so great' about it. It's perrfect. I used this to protect my table cloth from spills and my grand children when they are using the table as a school desk, serves my purposes very well. This clear tablecloth is wonderful because my patterned cloth tablecloth design shows right thru but both the table and tablecloth are protected from spills, scratches, etc. Very good product protects your table. I have this product on my dining room table and it looks very nice and I don't have ot worry about spills or tears in my nice table cloth works great. I would definately buy this item again! I am recovering my kitchen chairs and needed a heavy duty vinyl protector. I am very pleased with my purchase. Thank you for the tablecloth protector. I am very satisfied with my tablecloth protector. It has been a great help in regard to spills and especially fingerprints. I use it mostly on my kitchen table but have also placed it on my dining room table when entertaining. I have no negative comments. Thank you. It can be cut to size too.. I WILL KEEP BUYING THIS PROTECTOR ! Because it is clear, it protects my oak dinning table and sometimes my table cloths. usually don't replace them but once a year. This clear plastic covers and protects either the plain table or a decorative table cloth making them last a long time. Cost is low and can be replaced after many uses without worry. It will protect for a long time. Spills wipe up easily. Never worry about tablecloth getting ruined. Protects the lace tablecloth underneath so we don't have to launder the lace tablecloths after each use. 3rd time buying one. Love it. I put decorations for holidays first then clear cover over them looks beautiful. Love it. Love this! It protects our table, so that we can use a nice tablecloth, set a nice table, and still have children at the table with no worries. Protects my table and table cloth. Protects my cloth table cloth. We use the tablecloth protector in a church lobby where people use pencil to sign-up for events. Keeps the tablecloth looking spotless. We use it with a tablecloth skirt. Looks great! I was so happy to find the Tablecloth Protector as I had one years ago and Loved it! They are great to use on my Christmas Tablecloths with the clear protector over so I can have the beauty of the tablecloth and get no stains on it! The label says it is washer and dryer safe, but I haven't tried that yet! Hope it is! This is used over my beautiful dining room tablecloth. Easy to clean by using a soapy sponge. Excellent clean up for craft projects. This tablecloth protector replaces an older one I bought from Miles Kimball many years ago. It keeps tablecloths clean amid the many spills which do occur at a table that's used for 3 meals a day. It's a little long as I bought the size for when the table is enlarged for company, but that's really not a big issue. I also placed one on my dining table. Preserves the tablecloth,maintains its beauty and eliminates the need for washing as any spill of food of liquid wipes of easily. This is a wonderful purchase. For holiday's example Christmas i put a red tablecloth on then a lace one and then the clear protectant one i got from Miles Kimball and it just gives you that Christmasie feeling. The clear protectant one kepps every thing nice and clean and safe from any spills. You no longer have the 54" X 72"! I use this cover over my vintage cloth table cover to protect it. It makes everyday meal clean-up so much easier. Great for saving linen tablecloths! This has saved many tablecloths from accidents. I would never be without them. It lets my tablecloth show through. I use these all the time over a nice tablecloth--then I can wipe up any mess, etc., and have a clean tablecloth! With 12 grandchildren (9 boys) the table cover does a great job of protecting my table. My dining room table is over 100 years old and this protects under any tablecloth. It's great! I bought this to cover my mothers white christmas table cloth. It fit perfect. I put this tablecloth protector over the tablecloth to help manage spills. It works great. I only have to wipe it off after meals. I'd recommend it. My dining room table is normally a 57x52 or a 60x90 or a 60x120 depending on how many table leaves i have in. I have one for every size because through the holiday's you never know how many will be there to eat. I put a red tablecloth down then my grandmothers lace tablecloth and then the clear protectant one on top. With 9 grandchildren usually always something gets spilled but the protectant one keeps everything clean and dry. The see-through cloth shows off my nice tablecloth. Our cat jumps on the table so I remove the see-through cloth at meals. Guests are relieved! Would consider again clear vinyl tablecloth protectors! clear tablecloth protectors - bought a size for kitchen table, and one for dining room table. Nice heavyweight material. My friend started using the to avoid stains on nice material tablecloths. Thought it was a good idea. We always use these clear tablecloth protectors at church over the white vinyl table covers we also purchased at Miles Kimball. Keeps them white, stain-free, and lovely. These clear protectors are just the right thickness, easy to keep clean, and once thoroughly dry, fold and store until the next use. 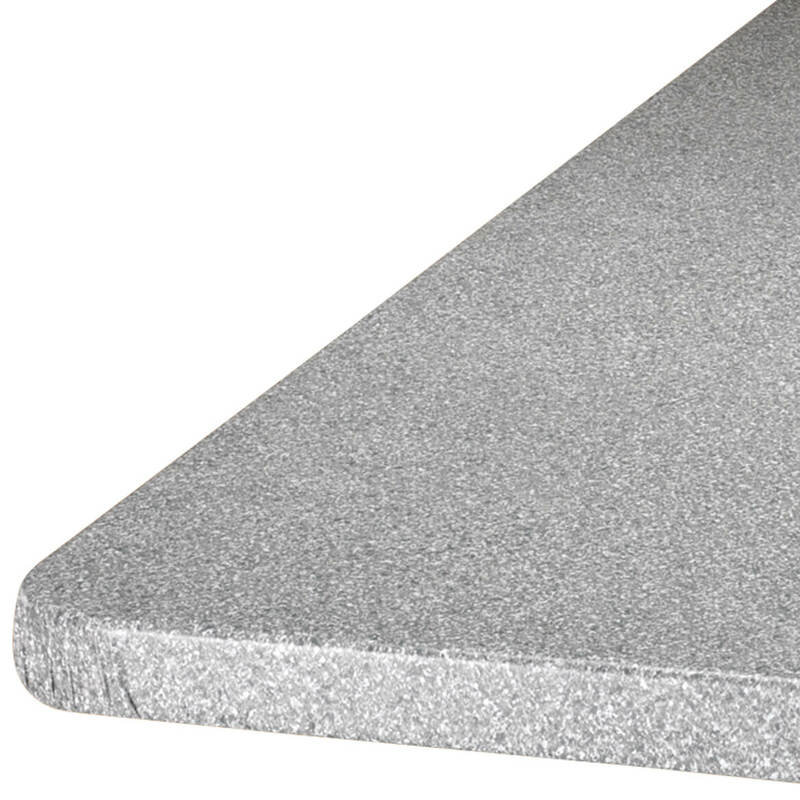 I bought 2 of these for my church to put under the top cloth we put over our expensive reception cloth in order to protect the expensive cloth from spilled punch (or various colors!). It works great and has saved us many cleaning bills. I use it over my cloth tablecloth so it don't get dirty. I always bought the department vinyl tablecloths. They usually got holes in them within a few months plus the designs were not very attractive for my country kitchen. So I decided to buy a country style cloth, tablecloth but I knew with kids, I would be washing it daily. I found this tablecloth protector and decided to order it. It wasn't as thick as I thought it would be but after using it, it serves it's purpose well. It turned out to be more sturdy than I thought. It wipes up easily and it shows off my country table cloth. Really changes the look of my new kitchen. Definately would buy again and again. If I can get more than a year out of it, then it is definately worth it. It is vinyl to protect the table. It makes the tablecloth look pretty and protetive. Saves alot of time wiping clean easily. Kudos. Every kitchen should have one. It gives life to your tablecloth and saves and preserves it. I wasn,t on a trip. SAVES THE EXASPERATION WHEN A GUEST SPILLS ON THE EMBROIDERED TABLE LINENS. KEEP YOUR COOL AND SMILE! With kids around, this is a must have. Spills were easily cleaned up. 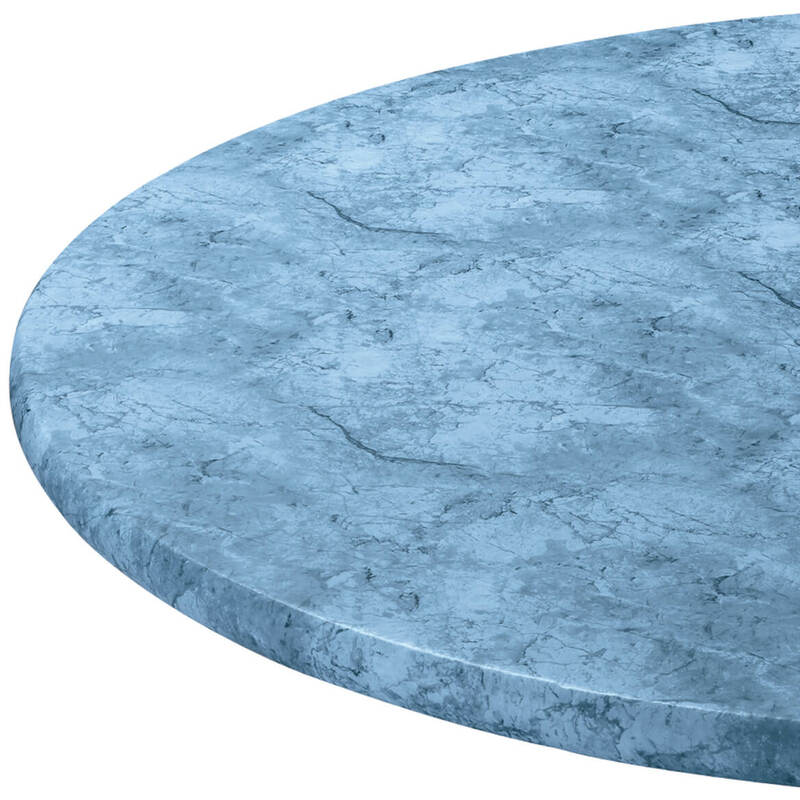 This protective clear table cover is easy to trim to adjust to the size of your round table. I put it over my printed elastic edged plastic table cloth, then tucked the edge in the elastic underneath the table. It adds extra protection to the surface. The clear table cloth is not real thick, so cats can claw and chew through it. I replace it about every six months. Cloth holders will tear it when you take them off and put them on when you want to change table cloths. Would be better if they made some with elastic. That would work better for children because they tend to move everything. The plastic is not as heavy as I had hoped. My daughter put her laptop on the table and the heat from the laptop left a mark in the plastic. Great for families without kids! This is a good product, but it could be a slightly heavier gauge. It tears fairly easily, but NOT if you use it for its intended purpose. We use these covers to wrap rugs, to protect them from being walked on, as well as to cover tables. When the plastic get walked on, it tends to develop small tears over time. I use it to protect a light-color table cloth that would be easily stained. This clear, non-sticky vinyl protector works fine. I use it on a table that is used 3 times every day it is thin but tough. If they made some with elastic to fit different size tables, I wouldn't have to use my cloth holders. When you want to change the cloth itself, some times the plastic cover will get ripped. I only like the see through plastic kind and can't find any one that sells them with elastic. 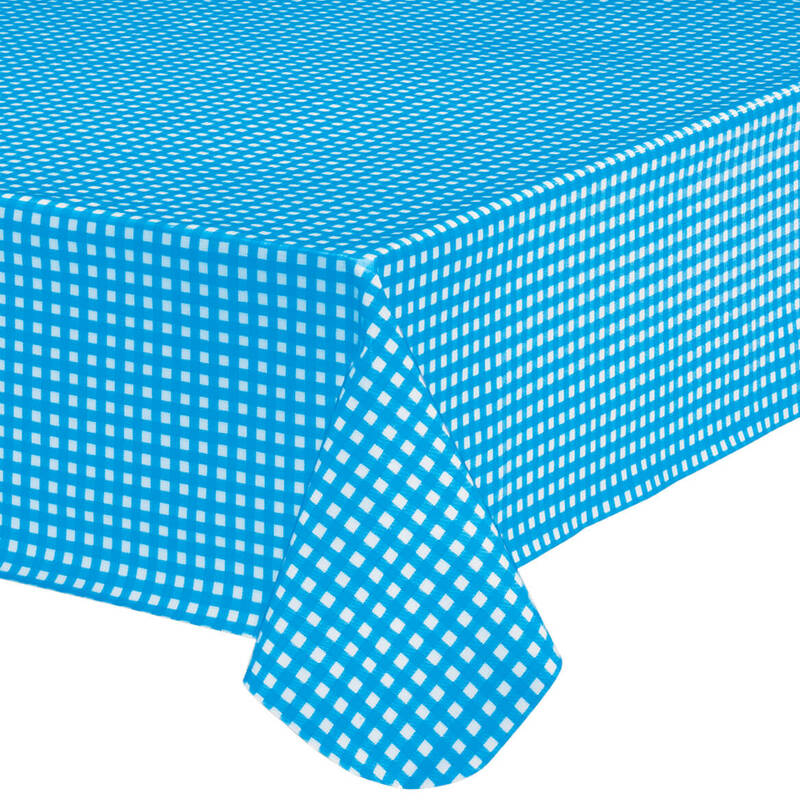 Fits nicely over a 52" square table and protects table cloths you don't want to get dirty. But be careful when placing something hot on the table protector - it is not heat resistant so use a hot pad or place a towel under the hot object. I mainly bought this to protect my nice table cloth and it was hard to find this size. 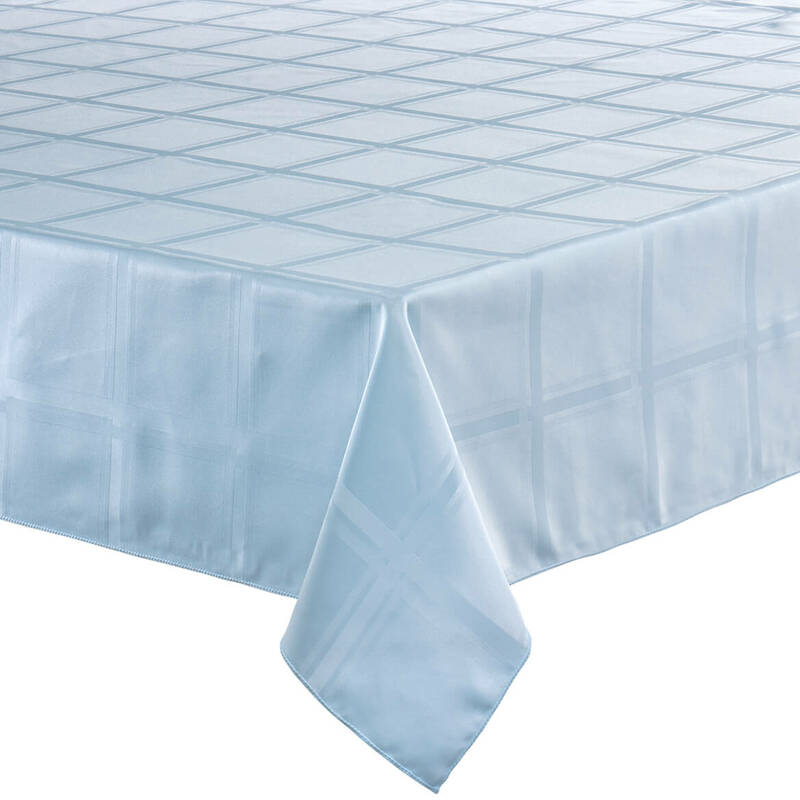 It does have lines through where it was folded doing shipping and it does move a lot when you wipe it or move but, I can live with all that it still protects my table cloth and the price wss right. It is a little on the thin side though. I put this on to protect from spills and keep my tablecloth in place. Without having placemats, you can expect your hot plate of food to stick to this and create wrinkles in it. I wish someone would invent a tablecloth that stayed in place because I like the look of just a regular tablecloth on the table without this piece of plastic covering it. That being said, this is a great price. Great covering over a nice tablecloth that you do want spills - use when grand children come. Plastic could be heavier. wanted something to keep spills off good tablecloth...this fits the bill...but it could be a little thicker plastic! This tablecloth protector is sufficient for its intended purpose, but plastic is very thin. Would be better coiled to avoid so many wrinkles. I tried to blow it out with a warm/hot hairdryer, but wrinkles remained--would probably take months to smooth out. It'll undoubtedly come in handy for some use, but not in my dining room. This item should be made of a heavier plastic, does not hold up so this time I will order 2 and after that probably will go to [...] and buy a sheet of plastic there. May not be as attractive but will certainly hold up with the kids. 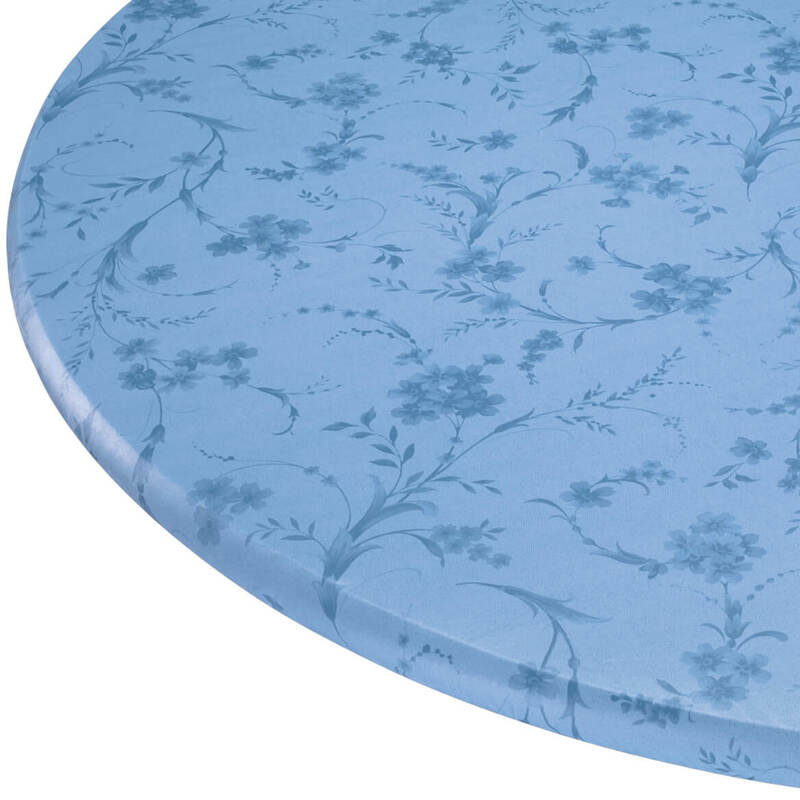 This table cover is of high quality plastic, keeps table clean and pretty. I bought this product, but its not that durable, it sulks when a little warm plate is even kept over it....I have to use additional surface protectors on it for usage during lunches and dinner. This is flimsy and dusty...had to wipe down front and back before using. Not sure how it will hold up with use. Can't get the wrinkles out! I was going to replace my glass pieces which are getting heavy to lift when I choose to change my tablecloth at my age - but I would much rather struggle with them because this look isn't a good smooth one! Go for the glass pices! [...] Tried to remove with 3 different kinds of heat,pressure, and layed out on table to relax the plastic. Still has distinct fold lines. It would be a great product if a heavier plastic were used. I couldn't get the wrinkles out to even use it and the least bit of heat on it will melt it. ITS JUST ANOTHER CHEAP FLIMSY SAD PRODUCT. MONEY WASTED AGAIN, BUYER BEWARE. IT DOES NOT UN-WRINKLE WHEN IT COMES OUT OF THE PKG EVEN AFTER A WEEK, A FEW SECONDS IN THE DRYER OR WARM WATER WIPE DOWN.. GET THIS AT A RESTRAUNT SUPPLY.. YOU GET WHAT YOU FOR. WOW! What a piece of junk! This is thin clear vinyl that is vacuum sealed into a small package for shipping. Upon opening and unfolding it you see nothing but hideous wrinkles. Nothing I can think of will undo the ugliness. Don't waste your time! best table protectors found. Very good quality. I was looking for a clear tablecloth. I've purchased these items before from you and they work very well. To keep food from getting on the real table cloth, and having to wash & dry it ever day. It work great. Its too easy to spill food on the cloth tablecloth and covering it with a clear one is perfect. I needed something to cover a brand new tablecloth. My sister loved this for her dining room table. It protected her table cloth. Have used this item before. To protect my tablecloth from our pet rabbit who has figured out how to reach the tabletop. I needed these items to cover my beautiful tablecloths and to make covers for my sofa throw pillows. I purchased a be tablecloth and need a tablecloth protector. I have been looking for a see through table cloth so i will try this one. I CAN'T FIND ANY WHERE AND I JUST REMEMBERED THAT I ORDERED FROM U GUYSTHE CLEAR TABLECLOTHS PROTECTED AND I'M GLAD U GUYS HAS AND THANKED YOU VERY MUCH. I couldn't find this kind of vinyl table cloth from the stores.Actually I did stop by several stores looking for vinyl table clothes..I need this item for my office. I would like to use my satin table cloths without having to worry that they will get stained. I use these all the time. they really save the table clothes. To protect my tablecloths from kid spills and cats. Also, have ordered these before and find them very useful. Had one liked it wanted a new one. The old one was yellow from my husband smoking. I have a precious hand-embroidered tablecloth and expecting guests for the holiday. Want to use the cloth and this should protect from cranberry and gravy stains.
. Since I don't want my good tablecloth to get ruined (,My protector has some little holes in it.) I bought a new one! I needed this length for the Holidays. what size would I need for an 8 ft banquet table? BEST ANSWER: Thank you for your question. We would suggest the 30" x 120" oblong size for an 8 ft table. We hope this information will be of help to you. when will the 70" round plastic cloth be available? BEST ANSWER: Thank you for your question. We unfortunately do not offer this table cloth is a 70" round size. We apologize for any inconvenience this may have caused. Hi this is Steven . I have a question description of the product says it's clear. But when look at picture it has lace design?. Which one is. BEST ANSWER: It is a clear top cover. You put ANY beautiful tablecloth on the table & cover with the clear plastic cover. I have used these covers since the 1970s. I love to use pretty lace cloths,but keep them protected. You just wipe off soils or spills. It's clear. The picture shows it over a lace tablecloth. I personally use mine under my lace tablecloth to protect my table. The lace tablecloth isn't near as valuable to me as my table is. It does the job. The clear table cloth protector goes over your regular table cloth. It will keep your fabric table cloth that's underneath clean. can the table cloth protector be trimmed? BEST ANSWER: I cannot think of a good reason why it cannot be trimmed. I trimmed mine and it is fine. Yes with a scissors to any length and width you need. Yes. A straight edge and a box cutter work great. it can be cut to whatever size you want it. Can you tell me if the plastic used for table cloth is supple or stiff and in time, possibly crack over time and does it stain easily? BEST ANSWER: The clear tablecloth is surprisingly supple and very durable. I ordered mine a couple of years ago and it's still holding on strong! Easy to clean too. No stains as of yet. Thank you for your question. The protector is flexible and is only .06mm think. We hope this information will be of help to you. I have a rectangle table that is 84 inch long by 42 inch wide how big should I get a table cloth protector? BEST ANSWER: Thank you for your question. You would need the 60" x 90" table cover. We hope this information will be of help to you. 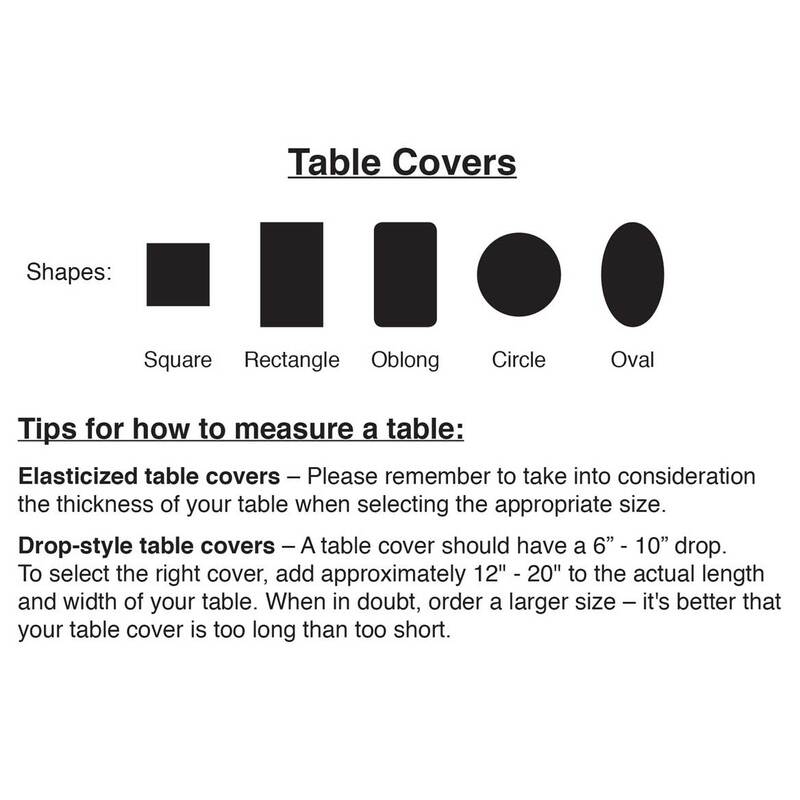 Do you know the mil weight for the table covers? BEST ANSWER: Thank you for your question. The table cover is .06 mm thick. We hope this information will be of help to you. My table is 70L & 42W What size would I buy? BEST ANSWER: 60x90 if your table is rectangular. You can always trim it to fit. I need 60 * 102? BEST ANSWER: Thank you for your question. You should order the 60" x 108". We hope this information will be of help to you. do you have any 64 by 64 clear tablecloth? BEST ANSWER: Thank you for your question. No, we do not offer that size. We hope this information will be of help to you. You use to sell a 54" X 54" clear tablecloth protector. Do you ever sell them? BEST ANSWER: Thank you for your question. We do not carry any in that size. We hope this information will be of help to you. Do you have 60''X120''in rectangular table cloth in clear plastic? BEST ANSWER: Thank you for your question. Yes we do. Please select the size in the dropdown box. We hope this information will be of help to you.